Side note: True, this is more of a financial indicator but the rationale behind this is a macroeconomic one! The 10-2 yield curve slope (in basis points=0.01%). Marked in red are when the yield curve inverted, i.e., the 10Y yield dropped below the 2Y yield. (2Y-yield was not available before 1976, so this is spliced with the 10Y-1Y spread before). At the Federal Reserve, they have a data tool to pull all sorts of interest rate data going back to 1919s (! ), see here. Even more convenient, the St. Louis Fed’s FRED database has a series that already calculates the 10-2 spread, see here. The yield curve normally inverts well before the start of the recession: 12-18 months! There are no Type 1 errors, i.e., the signal never missed a single recession over the last 50 years! There are (almost) no Type 2 errors, i.e., there were no false alarms. Well, I say almost because in 1998 the slope dropped very slightly below zero and then recovered again. The curve inverted again in 2000 and – like clockwork – the recession followed a year behind. A Type 1 Error, where the yield curve never inverts because the Federal Reserve is much more gradual in raising interest rates than in previous tightening cycles. Then the 10-year yield may never drop below the 2-year. But then some external catastrophic event, e.g., Rocket Man going crazy or a worldwide flu pandemic that paralyzes the world economy. The yield curve would likely still invert at that time (unless the flu wipes all the bond traders) but it would likely occur at the same time as the recession rather than before the recession. A Type 2 Error (false alarm), where the Federal Reserve is surprisingly aggressive in raising rates. The yield curve inverts because the 10-year yield is held down by demand for U.S. Treasury Bonds from abroad where interest rates remain artificially depressed. But the U.S. macroeconomy withstands the rate hikes and chugs along for another 5 years before going into another recession. I would probably not get too worried about just the yield curve inverting without any of the other indicators (see below) confirming the signal! Where are we now? It doesn’t look like the yield curve is that close to inverting (yet). As of 2/20/2018, the spread was about 67bps (0.67%), which is slightly below the historical mean (~1%) but it actually increased slightly since January! So, subject to the caveats mentioned above it appears that there is no imminent danger of a recession. If the next business cycle looks like the last seven the curve would have to first invert and then it might take another year for the recession to start. So, in light of this yield curve correlation, when I heard that whole chatter over the last few weeks about how rising interest rates will sink the economy I realized that I would have been more worried if the 10Y had dropped and further narrowed the 10Y-2Y spread. Now, that would have been scary! In addition to the unemployment rate, there is also data on unemployment insurance claims. What I like about the Claims data is that it’s released every week and, unlike the Payroll Employment data, there are (almost) no revisions to past data. The weekly raw numbers are a bit noisy sometimes, but if I plot the 4-week moving average we get the chart below, again with recessions marked as orange bars. Notice the pattern? Unemployment claims spike around recessions! Who would have thought? Unemployment claims (in 1,000s). Claims normally rise even before the start of the recession! Where to get the data: I got the time series from the St. Louis Federal Reserve FRED database, see this link. Forecast efficacy: The level of unemployment claims matter less than the direction. What I noticed is that around the beginning of each recession, the unemployment claims start going up, sometimes even well before the official start of the recession. Quite impressive! What’s more, the subsequent drop in the unemployment claims is also a pretty awesome indicator for timing the end of the recession! And again: all of this is with publicly (and free-of-charge!) available weekly data. You may remember the discussion last week about how the NBER is notoriously late in announcing the business cycle turning points. But there are a few (mostly) reliable macroeconomic indicators that provide much more timely information. If I had access to only one single macroeconomic indicator I would pick this one!!! Caveats: Just for the record, there have been a few false alarms: In 1995 there was a bit a rise. But we never got a recession and the claims eventually dropped again in 1996. Also, 2005 brought a huge spike due to Hurricane Katrina, which then reverted back down very quickly. So one should probably disregard temporary spikes from local and short-lived events! Where are we now? Currently, the unemployment claims are close to a 45-year low (! ), in the low 200k range. We’d need to see an increase to at least 300k or even 350k before I’d get worried about an impending recession. And that rise has to be sustained and not due to a localized and short-term event like a hurricane. So when I saw the stock market drop by 10+% earlier this month, I looked at the Unemployment Claims data and concluded that this patch of volatility will likely pass! PMI stands for Purchasing Managers Index. It’s a poll that asks decisionmakers at manufacturing companies about their business outlook. A level of 50 indicates that the positive vs. negative responses are exactly even. Below 50 is considered contractionary and above 50 expansionary. What I like about the PMI data is that it is released in a very timely fashion on the first business day of the month (covering the previous month). PMI Index: There have been plenty of occasions where the index temporarily dropped below 50 without a recession following. But a drop below 45 is a pretty good recession indicator. Where to get the data: I got a long historical time series from Quandl, but for some reason, it stops in 2016. I spliced the remaining data with the recent numbers from Ycharts. Forecast Efficacy: The PMI time series is a bit noisy, I’ll admit that. The index also regularly drops below 50 into the “contraction” territory with no recession in sight. But a reading of 45 or below is a pretty sure-fire signal of a recession around the corner or already in progress. In fact, every single recession saw a drop below 45 and every drop below 45 occurred during or was followed by a recession. It’s also pretty good at timing the end of a recession! That’s a pretty sharp indicator! Caveats: There have been two occasions where the PMI dropped below 45 only half-way through the recession (1974 and 2008). For example, during the Global Financial Crisis, the PMI dropped below 45 for the first in September 2008. That number would have been released on October 1, 2008 (the first business day of the next month). Nine months after the start of the recession! But keep in mind that the stock market dropped another 41% between October 1, 2008 and the March 9, 2009 equity market trough. So, the PMI would have been a bit late in timing the start of the recession but still excellent in timing the exit from the stock market! Where are we now? The PMI is not just in expansion territory; it stood at 59.1 in January! That’s well above average and well above anything that would normally indicate a recession around the corner. With the recent tax cuts, more investment demand and a pretty rosy business climate it seems that there is no recession in sight. Which would signal to me that, according to last week’s results, volatile markets are always a possibility but they are likely not the type that will ruin everybody’s retirement! … February is “Macro Month” on the ERN blog. 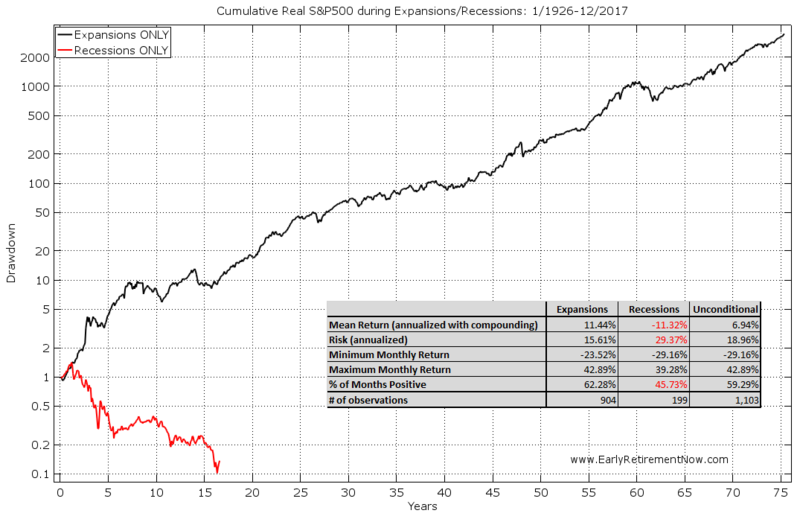 So I wanted to give a shout-out to my blogging buddy Actuary on FIRE who launched the first part of a series on the impact of inflation on early retirees. This is a joint-venture with yours truly so watch out for Part 2 of the series here on the ERN blog next week!!! I’ve been a passive investor and stuck with essentially 100% in equities through the last two major bear markets (2001-2003 and 2007-2009). It’s been much easier to so while accumulating assets because I could tell myself that I am picking up stocks at bargain basement prices. But risk control is much more important in retirement when the cash flows are reversed and we have to withdraw money from the portfolio: Say “Hello” to Sequence of Return Risk! And one way to deal with Sequence Risk is to actively (!) control the equity risk in my portfolio. It’s not a crazy idea! Todd Tresidder (Financial Mentor) mentioned the importance of managing risk in his ChooseFI Episode. And in my response to that episode (featured in Episode 52R), I agreed, though it took me until today to finally provide some details. Out of my three favorite macro indicators, not a single one is screaming “danger” yet. Again, I like to stress that macroeconomics is not the only thing one should monitor but we have to start somewhere and this is all I could fit into a 2,000-word post. More to come in the following weeks! We hope you enjoyed today’s post. Please share your comments below! Posted on February 21, 2018 January 10, 2019 by earlyretirementnow.comPosted in Asset AllocationTagged bonds, equities, finance, investing, Macroeconomy, personal finance. Great post and some impressive research also. Have you considered publishing a page on your blog with updated charts as the new numbers get released? That would be tremendously beneficial to your followers. Nice post on recession indicators! What would have been also nice would have been stock market data and how it correlates with these indicators for timing purposes. Fascinating post. I’ve always been a set it and forget it guy. Have you run sample results on portfolios using the data? For example, if you set an algorithm to sell an S&P 500 index as soon as the yield curve turns negative and buy once it turns positive, how do historical returns compare to holding on through thick and thin? 1. You stated that you would be concerned about the 3 macroeconomic events, but I didn’t notice you addressing the ‘how’ of changing your personal portfolio. Would you sell ALL equities right away or slowly or just a very small portion of them? 2. Would it mean you would be nervous because your AA will still be 100% stocks once you retire? BTW, what’s the day as it must be very close? 3. Should people who keep a certain percentage in fixed income while accumulating or are already early retired also get jumpy and start checking the data 6-12 months from today? I would find it stressful personally because I am sure I would misinterpret the data (no PhD in my lap LOL). Is it timing? 3.a) What an optimal percentage could be allocated to bonds (like Vanguard’s Total Bond Index Fund) that a person could re-balance and not worry about the macroeconomic events? Let’s assume that such a person doesn’t have unexpected personal situations that would force to sell in order to generate an unexpected amount of money. PS. I’ll visit your friend’s article, maybe it has some answers for me :-). Thanks! Wow, that’s a handful! 2: I should be retired by April 11. That’s when I leave town and head to Virginia for the ChooseFI Camp FI! I’m a bit less nervous now that I shifted some money out of equities and into real estate, but definitely the Sequence Risk issue is on my mind constantly! Cheers! Thanks for the great questions! Unfortunately, my technical skills for automating that are not sufficient. But I will make sure to give occasional updates. And if all three flash red I will definitely write a blog post about this!!! Thanks for these last few posts, I very much appreciate your analysis and the look into what you are considering to help make decisions. I understand the indicators above and the current state of the economy – what I am curious about is what you think about the interaction of valuations into this mix. I have found myself pulling equities out of the market to pay off our house recently and much of what has encouraged me in making those decisions is essentially a conversation that says, “well the literal top is impossible to predict and the gains have been more than I would have expected… take the money and run!” Along those lines, one of the links to your past articles pointed to one from last August where you said, “Just not all the way up at 23-24 for the P/E and 30+ for the CAPE!” And that moment has passed! So is there a point where you look to take some chips off the table given valuations (and some fear of unpredictable QE reversal effects?) or is the economic data correlated enough to the market that you don’t really worry about valuations regardless of how high they go? Perhaps a related questions is whether it is better to be early or late in changing allocations… but that is probably a whole different conversation! Thanks again, can’t tell you enough how much I appreciate your insights. I see where you’re coming from. Valuations are are pretty rich right now. But the experience in the past has been that P/E or CAPE has been a poor equity-exit indicator. I certainly would never ever set some fixed CAPE cutoff for when I get out of the market. But maybe do something gradual. Maybe reduce the equity weight by a certain % for each unit of CAPE we go above 30. Great post Ern. As an Econ guy I follow all three signals pretty closely. But as you noted all three can be corrupted by outside actions. The hard part with any Econ measure and the market is (also as you pointed out) determining what is leading versus lagging. I might also add m1 and m2 flow to the metrics to watch. Yeah, as I noted in another comment: this is part science, part art. Following the indicators blindly might create some false positives. But if all three indicate trouble I would get nervous! This was a fantastic post! I’ve known about the inverted yield curve and unemployment correlations for a while now, but the PMI was new to me, and very interesting! You put some solid research into this post, and I intend to bookmark it to review again later. Question: This is hardly a wise move and I would never recommend it, but what are your thoughts on purchasing inverted ETFs (like SH) when all of the signals are in agreement of an impending recession? I would stay away from all leveraged/short/short-leveraged ETFs. Fees are too high! If you want to reduce the equity share, do so. Much cheaper than holding equities and buying a Short-Equity ETF on top. What if you have to pay capital gains tax to sell equities? Does hedging (either buying puts or shorting index futures or ETFs) make sense then? Good question! I would probably do the timing within the tax-advantaged accounts and leave the taxable accounts alone. But one could also do the hedging with futures (Section 1256 contracts) if you’re sitting on large piles of equity funds in taxable accounts with low cost basis. I imagine futures are more efficient, but would hedging with an inverse ETF be that bad (in a taxable account)? If you had for instance $30,000 in equities, you could buy a 3x short index fund like SPXU with $10,000 in existing cash. As far as fees and the daily-reset tracking error, you are competing against paying a 20% long-term capital gains tax which is possibly a bigger hit. You wouldn’t be holding the hedge nearly as often as you’d be 100% long. Well, futures are much more granular. One contract is 50x the S&P500 = around $130,000. So, for small amounts, absolutely you’d have to go with short/inverse-levered-ETFs. But if you have a large sum to hedge, I’d prefer the ~$5,000 margin for one future over a $43,000 investment in a short ETF. Also, the tax treatment of index futures is superb: 60% long-term gains, 40% short-term regardless of how long you hold it (IRS Section 1256 contracts). Another great post. One thing about unemployment data is that over the last 10 years, there are a couple of items that are new. One is that the labor participation rate has declined. The other is that part time work has become much more common, possibly due to the Obamacare rules regarding 30+ hr/week employees. It makes me wonder if these might throw thing off or not. In general it looks like these 3 signals correlate with recessions, but they look late for market timing. I know you said last week that the official declaration of recessions is always lagging, but I just wondered if it is “enough” for actual market timing. Not that we’d do that, right??? Yeah, I’m not too worried about changes in the labor market. There have always been changes and today is no different. That’s why I don’t look at the level of the Claims but more the change. Also, I would never claim that you perfectly time the market with this. You will likely miss the equity market peak. But all I need is sitting out a little bit of the equity market drop, say, from October 2008 to June 2009. You would have missed the peak (that was in Oct 2007) and you would have missed the trough (March 2009) but this would have saved you a lot of losses! Big ERN, you never cease to amaze me. I love all 3 indicators but have a thought. It seems, based on the data you’ve presented, that ONLY the 2Yr – 10Yr Yield Curve gives a Proactive indication. Both the Unemployment and PMI seem to “lag” the economic reality. Would appreciate your thoughts on that. BTW, I loved the Todd Tressidor discussion (and subsequent AMAZING dialogue on the ChooseFI FB group). I do think the Sequence Of Return Risk is elevated for folks retiring in the next 0-18 months (June 8 for me, so I’m paying attention! ), It’s critically important to fill “Bucket 1” with enough liquid assets to ride out a downturn. It’s only a matter of time. I’ll be watching that Yield Curve closely, may want to pull some additional powder to give it time to dry. Yes, that’s completely true! Only the yield curve is truly ahead of the cycle and ahead of the equity peak. That’s a problem because you might miss out on the last 12 months of the bull market if you lose your nerve and pull out too early. Waiting for some confirmation from additional macro signals may not be so bad. Again: I’m not planning to get out at the peak and re-enter at the equity trough. It may already be a retirement-saver to suffer a loss of “only” 40% peak to bottom instead of the 57% drop (from 2007 to 2009). Thanks for stopping by, Fritz!!! So let’s see… After rallying for the majority of the day, the Dow, S&P 500, and Nasdaq all posted declines, supposedly because the 10 year treasury yield increased to a 3 year high. But, per the evidence presented in this blog post, this elevated 10 year yield should decrease the likelihood of an inverted yield curve (at least for the short term) and, thus, the likelihood of a recession (especially since, as reported, the markets were initially relived that today’s “Fed Notes” offered no surprises or hints of unexpected short-term rate increases). Yet the markets declined. Dizzying? Yeah! And no wonder economics is known as “The Dismal Science”. Thanks for another fascinating post! Fixed income folks smarter than equity traders? Maybe. Or, maybe they have fewer hormonal imbalances! For anyone who likes these kind of macroeconomic things, http://www.calculatedriskblog.com/ is one of the better one-stop shops for macroeconomic reports. He’s got a pretty good track record but I wouldn’t take him — or anyone else — as gospel truth. Nice link! Thanks for sharing! Wow! Another truly fascinating post. Should you choose to do a side hustle in early retirement, I personally think that you’ve found it. A hedge fund based on the principles in this series!! I for one would consider investing, and I’m confident others would as well. 5. Deflate consumption in the short term. I wanted some notion of what reduced consumption actually felt like on a behavioral level while things are good instead of waiting till things are dire. This is very positive towards planning and understanding cash flow. Cash flow is different once the paycheck stops and the portfolio converts from accumulation to dispersal. Also tax planning becomes critical in the peri-retirement period. The government wants their money come hell or high water. It’s even worse once a spouse dies. Just that change can kick you up 2 tax brackets. Not trivial. 6. Before retirement get major expenses out of the way for example I bought a new retirement car a couple years ago which should be good for a decade or more. I put a new roof on my home 6 years ago. My goal is to not live like this forever but just for 5 years. I call it my early retirement epoch. 5 years in SORR becomes less ominous to portfolio survival. I feel pretty positive about the economy but my goal is to complete the 5 year epoch. A t the end of 5 years I will take SS and my wife will take it 3 years after that so I will re-retire at those times with a different financial horizon and cash flows. I feel at the end of 5 years I will have more freedom to glide path fairly rapidly into more risk as each year I get away from T=0 there is less risk of failure. This is a little different approach than a market prediction driven approach you have outlined. Which I think points out some of the unconsidered risk of giving up a paycheck. Agree with the 3% SWR, but 55%/45% seems a bit too low on equities. Are you going to walk that back up again over time? I like the idea of buying a car (new or close to new) right at the beginning of retirement. Get a big ticket item and potential large repair payments out of the way. Lowers sequence risk! I’m way more conservative and risk averse than you. I haven’t ever been 100% in equities, not even when I opened an IRA many, many years ago. I’ll never reach the annual returns you experience, year after year. By the same token I’ll have very little at risk during the next bear market. I’m currently 25% equities (remainder in cash, agency mortgage bonds and “alternatives”)and five years from FIRE. I can’t afford to lose any principal now as I’ll have no time to recover it this close to retirement as I’m dead set on 2023 being my year to end work. Wow, you are risk averse! Now is the time to go max risk! But you gotta do what you’re comfortable with. What alternatives do you have? I like real estate as a hedge against inflation. I use real estate crowdfunding as well as two hedgefunds I’m invested in. I see. That will get you some higher returns! Thanks for sharing!!! Nice paper! Will see if I can incorporate their results in a future post. Thanks! Any way to include the whole post in the email so we can read it offline? Nice! Thanks for sharing! I don’t like the UER that much because it’s lagging behind the unemployment claims. But it’s a reliable indicator! Once it rises by more than 0.4 or 0.5%-points we’re in a recession, for sure! This second link I think is most interesting. His data show that getting out of the market a month before a recession and back in a month before it ends, has very little benefit except for the housing bust, which tells me recessions don’t correlate with markets. The first thirty five years from philosophicaleconomics.com using this approach, trails buy and hold! Not really sure I would agree with that. My calculations show that recession timing (especially if you are 1 or even better 3 months ahead) very consistently beats the buy and hold strategy. thanks for reading! I am very much looking forward to your follow up article which I hope will show your data on the performance of this strategy. We’re close to inverting the yield curve! Yeah! But I still hope it doesn’t inverted. Even if it does I could come up with a theory for why “this time could be different” the Fed is much more gradual and foreign flows into the US bind market suppress the yield every time we go above 3%. Look at real retail sales growth. It would have tipped you off in 2000 and 2008 to get out of the market. Kudos for all the research you do and share with us! When in Belgium, tweet me for a thank you beer! Thanks, ATL. Actually, I will take you up on that offer. We plan to spend about 10 days in B/NL in late August, so tentatively, we should be in Brussels/Ghent/Antwerpes for a week arouns August 20-27. Will let you know more details once we finalize the plans! Will be nice to catch up over a beer! Excellent. We are back in Belgium on August 17. So that matches. Feel free to asks questions on things to do or places to visit. I don’t know of anyone who has been able to predict recessions reliably in time… the profession is littered with failed forecasters! However maybe it’s possible to determine “elevated risk” of recession, and you could successfully use this NOT to sell out of stocks, but to then “turn on” a normal price-driven risk management strategy. You would expect whipsaws (some recession false alarms, or early alarms that appear to fade before the actual recession arrives), as with any strategy, but maybe fewer than a price-driven risk-management strategy on its own. 1. If you are rolling your own recession indicator, how did you decide on just the three above? For instance I hear corporate bond credit spreads, or housing starts or new home sales can be useful. 2. How far into the yellow or red do each of your indicators need to go before the on/off “trigger” is pulled? What if only two of the three are yellow? Are you expecting to involve some subjective interpretation, when the time comes? 3. What happens when a trigger is pulled? I like the Philosophical Economics GTT idea ( http://www.philosophicaleconomics.com/2016/02/uetrend/ ): implement for instance a simple 10-month SMA strategy when recession risk reaches a previously-defined level. For instance, it appears your three indicators could easily trigger as much as two years too early before the 1980 and 1991 recessions! A price-dependent strategy like a 10-month moving average could take over once recession is flashing yellow (as no one can predict the actual recession start). You seem willing to share your process very transparently, which is why this blog is so valuable! And thank you for the great feedback you provide to all your readers! Also, we think very much alike! What you mention in #3 is exactly how I think about the world. Just a blind 10-Month MA momentum signal is imperfect. Too many false alarms. A macro signal in conjunction with the momentum signal should work best! Problem is market performance does not merely mirror economic factors alone. Changes in liquidity (caused by monetary policy) and market reflexivity add huge swings. Do you feel the recent trade war threats and actions by the administration can derail us markets, even in a strong economy? Or does anyone think it will somehow improve returns. Not political, just concerned. Most definitely! Right now it’s mostly a war of words with some symbolic tariffs here and there. That’s not too damaging. If it escalates from here and we end up with a 1930s style trade policy, that would certainly be bad! But we’re a long way from that! I like that you found unemployment claims can also signal the end to a recession. I’m curious, what makes you think there will be another recession in 12-18 months? What indicators point to the current synchronized global expansion slowing down that much? Or is it more of a feeling of being in the top of the economic cycle? I meant that the recession is following 12-18 months after the yield curve inversion. Not 12-18 months from now! Sorry for the confusion! No worries. Thanks for clarifying. I love your work. What do you think about current 3m/10y inversion? Or does this seems to you like Type 2 error?